Etiology: Guinea pigs have continuously erupting teeth throughout life. Malocclusion occurs when the premolars overgrow because the mandibular and maxillary teeth are not normally aligned and do not properly occlude. The cause of the condition is thought to involve genetic factors as well as dietary factors (particularly inadequate roughage in the diet). Incidence: The incidence of malocclusion is common. Clinical signs: Premolars are overgrown and misaligned, and incisors overgrow as a sequela. The tongue may become entrapped and traumatized. Guinea pigs may drool, have a poor body condition and evidence of poor growth . Diagnosis: Malocclusion is readily diagnosed by an oral examination. 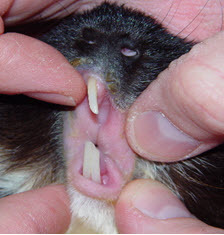 Pictured below is a guinea pig with incisor malocclusion and a missing incisor.